WINNER OF THE DRINK BOOK AWARD AT THE FORTNUM & MASON FOOD AND DRINK AWARDS 2017. 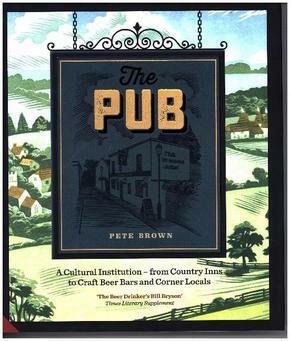 Pete Brown has visited hundreds of pubs across the UK and is uniquely placed to write about pubs that ooze atmosphere, whatever the reason, be it food, people, architecture, location or decor. The best pubs are those that always have a steady trade at any time on any day of the week, and where chat flows back and forth across the bar. They're the places where you want to drink weak beer so you can have several pints and stay longer. Some are grand Victorian palaces, others ancient inns with stunning views across the hills. Some are ale shrines, others gastropubs (though they probably don't call themselves that any more). A precious few are uniquely eccentric, the kinds of places that are just as likely to have terrible reviews on Trip Advisor as great ones, because some people don't realize that the outside toilets, limp sandwiches on the bar and really disturbing full-size mannequin glaring at youfrom the corner are all part of the charm. This collection of 300 pubs with atmosphere will include 50 pub features and 250 smaller descriptions, alongside quirks of local history, pen portraits of punters or publicans, legends, yarns and myths, and case studies of different trends and types of pub.